Ever wanted to create a slideshow of images, text and audio? Perhaps you want to create a simple video but don't want to get involved in video editing software. Presentation software is an alternative that might work for you. 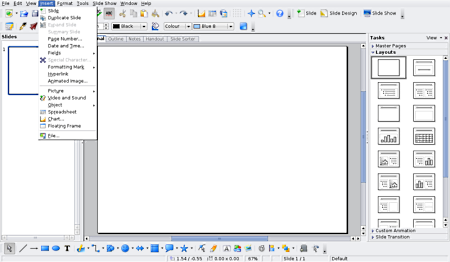 This article will show you how to make a presentation with OpenOffice.org Impress, which you can easily export to flash (the most common video format online) so you can share it with others. 1. 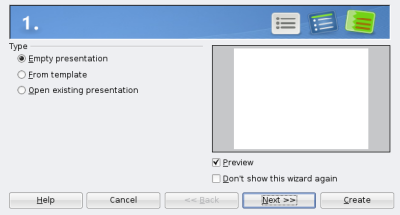 Launch OpenOffice.org Impress and the wizard should appear. 2. Choose type (empty presentation, from template or open existing presentation) and click Next. 3. 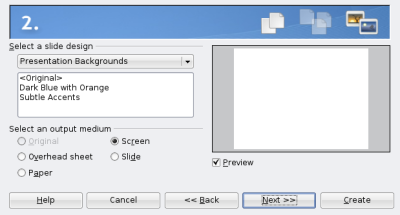 Choose a slide design (presentation backgrounds or presentation templates), leave output medium as screen and click Next. 4. 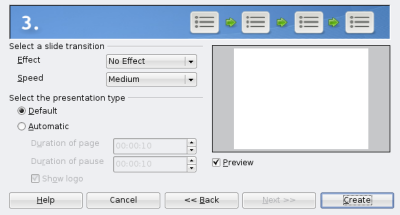 Choose a slide transition (effect and speed) and click Create. 5. Click Insert then add text or a picture. 6. Click Insert then Slide to add the next slide.